DC Comics is launching a new superhero comics initiative, “The New Age of DC Heroes.” This line of comic books will consist of eight new comic book series: The Curse of Brimstone, The Immortal Men, New Challengers, Sideways, The Silencer, The Terrifics, The Unexpected, and the subject of this review, Damage. Damage is written by co-creator Robert Venditti; drawn by co-creator Tony S. Daniel (pencils) and Danny Miki; colored by Tomeu Morey; and lettered by Tom Napolitano. 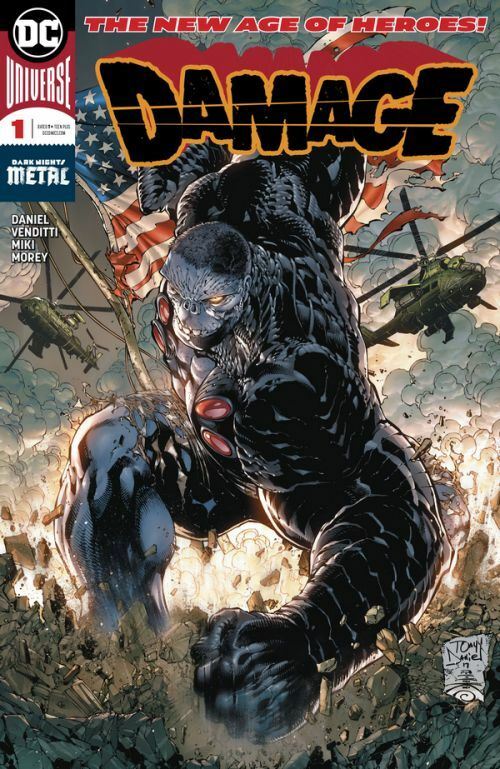 Damage focuses on a U.S. Army soldier who is turned into a monster destined to be a weapon of mass destruction. THE LOWDOWN: I am cynical about the launch of new comic book lines, especially when the Direct Market comic book sales are in free fall, as they reportedly were in 2017. On the other hand, “The New Age of DC Heroes” is designed and illustrated by a “murders row” of accomplished and popular comic book artists, referred to as “DC's Master Class.” They are Jim Lee, Andy Kubert, John Romita, Jr., Ivan Reis, Kenneth Rocafort, Philip Tan, Ryan Sook, and Damage artist, Tony S. Daniel. It is the art and graphical storytelling in Damage that makes this comic book worth a look. Tony S. Daniel's time at DC Comics has seen him become a highly polished artist, who can draw superhero, action, and fight comics that are good enough to put him in the upper echelon. His inker is Danny Miki who is in his own master class; Miki could probably ink the pencils of people who can barely draw and turn those pencils into something decent. Conceptually, Damage seems like a blending of Marvel's The Incredible Hulk, Dale Keown's The Pitt, and Tony Daniel's 1990s Image Comics series, The Tenth. Damage is not groundbreaking, but, as I said, the artists, colorist, and letterer deliver a graphics package that is so visually attractive that even my cynical self wants more. I READS YOU RECOMMENDS: Fans of new DC Comics things will want Damage.